Waco,Texas (April 10, 2012)- One hundred years after Arthur Eldred of New York earned the first Eagle Scout Award from the Boy Scouts of America, researchers with Baylor University's Institute for Studies of Religion (ISR) and Program on Prosocial Behavior have released findings from a nationwide, scientific survey that demonstrates the significant, positive impact Eagle Scouts have on society - from holding leadership positions in their workplace and neighborhood to voting and volunteering to protecting the environment and being prepared for emergencies. "There is no shortage of examples or anecdotal accounts that suggest Scouting produces better citizens, but now there is scientific evidence to confirm the prosocial benefits of Scouting or earning the rank of Eagle Scout," said the study's principal investigator, Byron R. Johnson, Ph.D., Distinguished Professor of the Social Sciences, director of the Program on Prosocial Behavior and ISR co-director. "The central question of this study was to determine if achieving the rank of Eagle Scout is associated with prosocial behavior and development of character that carries over into young adulthood and beyond." With funding from a major two-year research grant from the John Templeton Foundation, Baylor researchers with ISR's Program on Prosocial Behavior partnered with the Gallup Organization to conduct a nationwide random survey of 2,512 adult males. 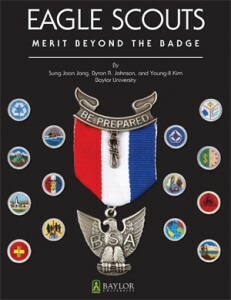 The full study - "Merit Beyond the Badge" - can be downloaded at www.baylorisr.org.  Indicate that they have built character traits related to work ethics, morality, tolerance and respect for diversity, such as always exceeding people's expectations and doing what is right, working hard to get ahead, treating people of other religions with respect, strongly agreeing that most religions make a positive contribution to society, stating that respecting religious leaders outside of their religions is somewhat important and showing respect to the American flag (Figures 40-46, pp. 24-27). Young-Il Kim, Ph.D., a Post-Doctoral Research Fellow at ISR and study co-author, found that "Eagle Scouts consistently indicate their experience in Scouting contributed to positive and prosocial development." "Compared to Scouts and non-Scouts, Eagle Scouts exhibit significantly higher levels of health and recreation, connection, service and leadership, environmental stewardship, goal orientation, planning and preparedness, and character," said Rodney Stark, Ph.D., Distinguished Professor of the Social Sciences at Baylor and co-director of ISR. The Eagle Scout badge has become widely recognized as a mark of distinction both within and outside of Scouting. Once earned, it is worn for life. Since it was first awarded in 1912, more than 2 million young men - about 4 percent of Boy Scouts - have achieved the Boy Scouts of America's highest rank. To do so, Scouts must demonstrate their understanding of leadership, service, character, personal fitness and outdoor skills at multiple levels. In addition to the 21 life skills merit badges required to earn the Eagle Scout rank, each Scout must complete an extensive self-directed service project. The Scout must plan, organize, lead and manage the entire service effort prior to his 18th birthday. The average number of hours spent on Eagle Scout projects is 130. In 2011, more than 51,000 young men earned the Eagle Scout Award, which means Eagle Scout service projects alone represented almost 6.7 million hours of community service.  Mike Rowe, television personality and host of the Discovery Channel's "Dirty Jobs"
"Eagle Scouts have made their marks throughout history--from walking on the moon and working behind the desk in the Oval Office to running the bases in the major leagues. And while we're proud to claim some truly great men in American history among our ranks, we're even more proud that everyday Eagle Scouts become wonderful husbands, fathers, and citizens," said Bob Mazzuca, Chief Scout Executive of the Boy Scouts of America. "This research validates for the world something we've known about Eagle Scouts for years. They lead. They vote. They donate. They volunteer. They work hard and achieve their goals. In short, Eagle Scouts are exceptional men." Baylor University is a private Christian university and a nationally ranked research institution, characterized as having "high research activity" by the Carnegie Foundation for the Advancement of Teaching. The university provides a vibrant campus community for approximately 15,000 students by blending interdisciplinary research with an international reputation for educational excellence and a faculty commitment to teaching and scholarship. Chartered in 1845 by the Republic of Texas through the efforts of Baptist pioneers, Baylor is the oldest continually operating university in Texas. Located in Waco, Baylor welcomes students from all 50 states and more than 80 countries to study a broad range of degrees among its 11 nationally recognized academic divisions. Baylor sponsors 19 varsity athletic teams and is a founding member of the Big 12 Conference. Launched in August 2004, the Baylor Institute for Studies of Religion (ISR) exists to initiate, support and conduct research on religion, involving scholars and projects spanning the intellectual spectrum: history, psychology, sociology, economics, anthropology, political science, epidemiology, theology and religious studies. The institute's mandate extends to all religions, everywhere, and throughout history, and embraces the study of religious effects on such things as prosocial behavior, family life, population health, economic development and social conflict. While always striving for appropriate scientific objectivity, ISR scholars treat religion with the respect that sacred matters require and deserve. The Program on Prosocial Behavior emphasizes the "neglected half" of human behavior: why so many people generously give money to help those in need to understanding the factors that help people reared in 'bad' neighborhoods turn out not only to be law-abiding, but to be good citizens. For more information, visit www.baylorisr.org. The Boy Scouts of America provides the nation's foremost youth program of character development and values-based leadership training, which helps young people be "prepared for life." The Scouting organization is composed of 2.7 million youth members between the ages of 7 and 21 and more than a million volunteers in local councils throughout the United States and its territories. For more information on the Boy Scouts of America, please visit www.scouting.org.